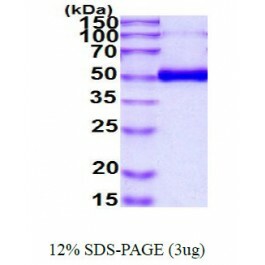 (On SDS-PAGE under denatured condition, apparent molecular weight of glycosylated rhOPG protein will be appeared at approximately 55kDa). Osteoprtegerin (OPG) is a member of the tumor necrosis factor (TNF)-related family, is referred to as TNFRSF11B and part of the OPG/receptor activator of NF-кB ligand (RANKL)/receptor activator of NF-кB (RANK) triad. This cytokine that lacks any apparent cell-association motifs and exists as a soluble secreted protein, network regulates the differentiation and activation of osteoclasts and hence the critical balance between bone formation (osteoblasts) and bone resorption (osteoclasts). A. Van Campenhout, Golledge J. (2009) Atherosclerosis 204:321-29. 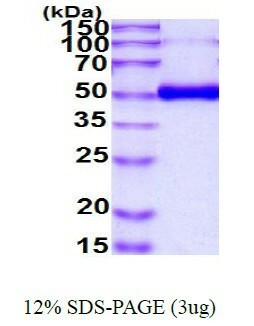 Recombinant human osteoprotegerin protein, fused to His-tag at C-terminus, was expressed in insect cell using baculovirus expression system and purified by using conventional chromatography techniques.